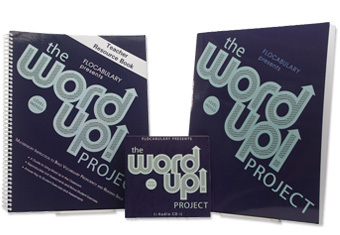 The Word Up Project: Level Indigo directly teaches 140 vocabulary words to increase students’ reading and oral comprehension, vocabulary, and writing ability. The units teach word meaning through a series of increasingly challenging exposures, including a nonfiction reading passage. The Teacher Resource Book contains a complete guide to using The Word Up Project in the classroom, including lesson plans, additional activities and reproducible tests for each unit. Written at a 5th grade reading level, this title can be used with advanced 4th graders, struggling 6th graders, and English language learners. The program is proven to raise state test scores. Good evening! Allow me to introduce myself: I am Dracula Junior. So big that it can’t be missed; that’s where he lives. That’s the only time when he’s feeling right. He must be sad in that big old home. ’Cause he’s the son of Dracula, the vampire. He decided to be different from his brothers. He didn’t want a werewolf; he wanted a pug. Buying Pokemon cards on eBay. He changed his whole life right there. In his kiddie pool he likes to relax. And he’s reading the autobiography of Obama. A giant meal with food that’s just out of sight. And now he has over 500 friends on Facebook.